Forest trail, Palm spider and some bloom. After lazing around on the beach it was time for another expedition in the ‚island jungle‘. So I challenged the Sentier Vacoa Trail (Grand Anse) through the Riverine Forests, dominated once by Vacoa plants. 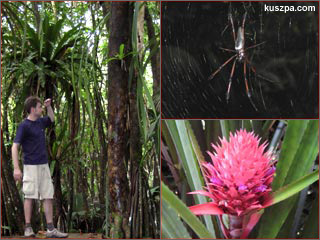 On the way I saw some nice Seychelles Palm spiders (Argiopidae spider? ), but the flora was also very interesting, e.g. the Pandanus hornei palms with roots above the ground.